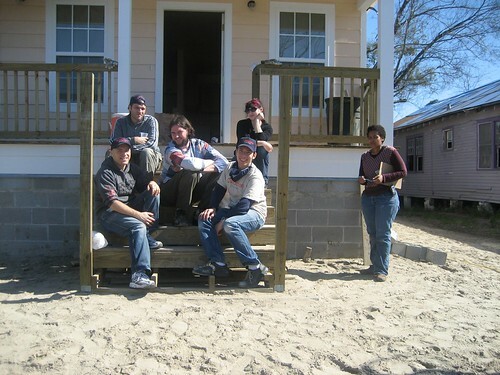 A few hours ago a bunch of us got home from the 9th Ward where we volunteered with Habitat for Humanity. Aaron, Owen, Kary, Alex, Jonathan and I got up at the crack of dawn and took a cab down to 4000 N Roman Street where we got to see the beginnings of the Musicians’ Village project that Habitat has been working on. We then went a few blocks away, on (a street car named) Desire St to some infill housing to help with some security and finishing work. The houses, mostly complete still need more interior and landscaping work, and some exterior finishing. Our crew leader, Ronnie showed us the first and most important bug: the back door on one of the houses had been improperly installed. A patch had been applied in the form of a 2 x 6 screwed over the door. Owen and I removed the “patch” and began digging in to figure out what was wrong. Neither of us had ever properly installed a door, or shimmed an improperly installed door. We quickly realized that we did not have the right tools for the job, especially because the previous volunteers had stripped certain screw heads and also used the wrong screws. We told Ronnie about the problem, she took us over to the second house to screw down some front stair treads and she called for a reciprocating saw so we could cut through the stripped screw. The door was such a big issue because these houses had been broken into recently and materials were stolen. While we were assessing the door situation, Aaron and Karyn were fixing a window in the other house that had been broken. Alex and Jonathan were priming trim in the house to get it ready for a nice coat of paint. We took lots of pictures and some video, which will be up soon. Owen and I returned to the first house with the reciprocating saw (sawsall) and successfully cut the screw allowing us to remove the entire door frame and figure out the problem. We then reinstalled it and shimmed it, screwed it in, added some moldings and caulked it. When we finished, the door was secure. I think I speak for the team that it felt really good to get away from the computer and work with our hands for a day, especially with Habitat for Humanity, and most especially here in New Orleans.